Rooms are located at 214 Brunker Road Adamstown 2289. The rooms have onsite parking. Please ring 02 4952 7400 for appointments. We take up general adult and Paediatric orthopedic patients including joint replacements ( hip and knee replacement ). Please send or fax referral to the new rooms. Please call if you wish to discuss any of this information in more depth, or if there is any need for urgent orthopedic attention. If you have any questions, feel free to contact any of our welcoming staff on 02 4952 7400. Please refer to the map for our location. Dr Sandeep Tewari [BSc, MBBS, MS (Ortho), FRACS, FAorthA] is an orthopaedic surgeon in Newcastle hunter region NSW Australia. Dr Tewari provides care to patients of general orthopaedics including joint replacement and Orthopaedic Trauma. 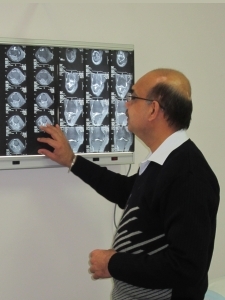 Dr Tewari has special interest in paediatric orthopaedics and lower limb deformity correction, including limb lengthening and foot and ankle surgery. This website provides information about services provided and other useful information for the patient. The information provided does not replace the advise of your doctor or the advise you may be provided on your consultation.